We call it “social” media but that’s kind of a joke. Let’s be honest. We have hundreds of “friends” but most of them have been deleted from our newsfeed because we either A.) can’t remember who they are, or B.) don’t care about what they have to say. Of the “friends” that make our newsfeed cut, many of them are just there because we like to spy on them. We can get the juicy details without actually being involved in their lives. If we were to meet up with some of our “friends” in real life, we would either be too intimidated by their “perfect” lives or too disgusted by the “dirt” to have a genuine conversation because we feel like we already “know” them. Do we sound pathetic yet? We gauge the level of people’s approval of us by how many “likes”and comments we get on our status or photo. But, remember some of these likes and comments come from people we’ve removed from our newsfeed so I’m not sure they should really count. We are inundated with articles, videos, memes, etc. that other people have read, liked, commented on. Information overload! We don’t have time to read, watch, and look at all of them, but then we feel liked we might have “missed” something. Not to mention that a good portion of the stuff people share on social media sites isn’t even true! But we don’t have time to read everything let alone fact check it! I’m feeling stressed just writing this. 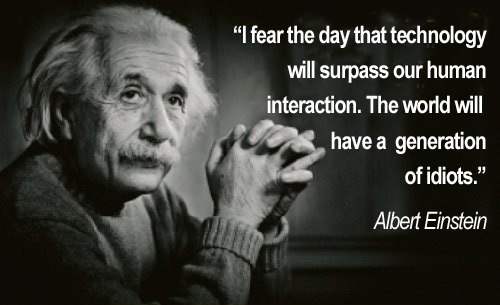 I recently heard this quote from Albert Einstein. Pretty sure that day is here. So, what do we do about it? The ironic thing is…I’m about to go share this on my Facebook page.